Film festivals such as Toronto International Film Festival and Sundance Film Festival generate a massive amount of hype around its larger titles, which inevitably receive distribution. While many of these do well in the festival setting, when one takes away the excitement of the big crowds to experience it with, the feature can offer a very different experience. This is generally what leads to the hyperbole of a film, which always makes me weary of covering a movie that receives such praise within the festival circuit. However, some of these features are genuinely worthy of the hype, as they simply deliver the wonderful cinematic experience that doesn't necessarily require the large crowds of a special event. 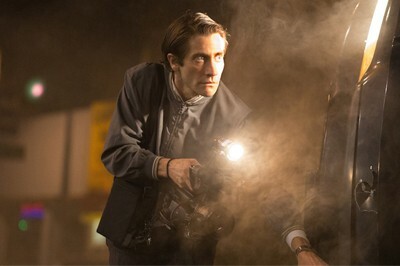 Writer/director Dan Gilroy's directorial debut Nightcrawler is one of those pictures. 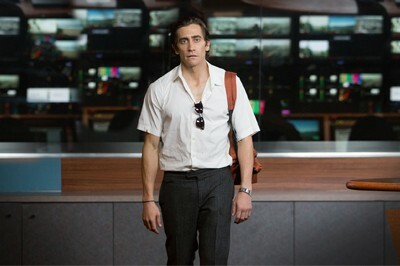 In the competitive job market, Louis Bloom (Jake Gyllenhaal) doesn't shy away from the world of crime. However, he continues to search for the "golden ticket" that is the profession that he can master. On one fateful night, he stumbles upon the world of Los Angeles freelance crime journalism, as he watching a camera team at work. When he discovers his skill for framing, he decides to pursue the career by starting his very own operation in the underground scene. Nightcrawler is so much more than a run-of-the-mill thriller. It's both a character study, as well as a look at our culture's amusement with crime and violence within our news reports. From the moment the film begins, something about Louis seems strange. Aside from the fact that he's a criminal, something about him makes us feel that he's hiding something much bigger. As he continues to realize his skill level in freelance crime journalism, his ego gradually expands. While we never truly get to see much of his past, his actions are louder than any words that can be spoken about this character. He's cunning, creepy, and bold. Louis will stop at nothing to thrive at his business, and ensure that citizens are receiving the very best of crime reporting. Both the plot beats, as well as Louis' character development contribute to the film's overall message of the exploitation of violence in our society. Nightcrawler offers a fascinating look at a part of journalism that is rarely, if ever, explored in the media. With each crime scene that Louis encounters, he continues to crave better material. He has a good eye for framing, and is even willing to contaminate a crime scene in order to get the best pieces of journalism for both the money and the reputation. Nina Romina (Rene Russo) is a desperate news director, who is more than willing to pay Louis for his demented videos, which are on the verge of being unacceptable for television. As the second act continues to build upon itself, Louis starts to become even more brave when it comes to marching into crime scenes that he shouldn't be getting involved in. This success causes him to form an incredibly strange business relationship with Nina, and journalist competitor Joe Loder (Bill Paxton) makes it his goal to beat Louis in this wild career. The relationships that he creates with those in his professional life are fascinatingly odd and eerie, as he's willing to do absolutely anything in order to end up with the advantage. This can be a terrifying character trait, especially when one has nothing to lose. Nightcrawler is fascinating and intense, but it doesn't shy away from its dark comedy. Rather, it places this satirical content in the spotlight. While some of these bits come across as nervous laughter, Gilroy manages to utilize the picture's sense of humor extremely well. This greatly compliments the more serious material. Given that Louis is absolutely insane, the comedy allows him to get away with more bad behavior in front of audiences. While we don't agree with what he's doing, nor the methods that he's utilizing in order to achieve his goals, we still somehow find ourself rooting for him. Perhaps this is tied to how charismatic and hypnotizing he can become. Nightcrawler loves to play with viewer expectations and emotions in order to shift our feelings for both Louis and the scenarios that he gets himself involved in. The central performance here is that of Jake Gyllenhaal in the role of Louis Bloom. Gyllenhaal is absolutely tremendous. This just might be the best performance of his career, as he has truly become this character. He's creepy, hypnotizing, and convincing. Having lost 20 pounds for the role and maintaining "bug eyes" throughout the running time, he displays an exceptional sense of delivery. Bill Paxton is a lot of fun as Joe Loder. My only gripe here is that we don't get to see more of him. Rene Russo is quite impressive in the role of Nina Romina. She's entirely believable as the news director, who is willing to do anything in order to get the ratings up on her graveyard schedule. Nightcrawler features a round of excellent performances that truly drive the film. Gilroy has an exceptional sense of visual style. Nearly the entire running time takes place during the night hours, and he gives Los Angeles a wonderfully dangerous tone. The darkness is often broken up with city lights and the illumination from the camera, often delivering the atmosphere of an actual news report. When the film ventures onto the streets, we're introduced to exciting cat-and-mouse games that truly drive up the intensity. Some will have issues with the picture's score, as it doesn't entirely fit into the picture's overall tone. Even so, Nightcrawler has a superb sense of style. This might be Dan Gilroy's directorial debut, but he has displayed a true mastery of the craft. He has delivered a truly unique and original thriller that takes an intriguing look at crime journalism with a sense of intensity that exceeds all expectations. Jake Gyllenhaal is tremendous in what could easily be considered the best performance of his career. Gilroy successfully delivers a despicable character that we just can't help but root for, as he continues to descent further into his own madness, leading audiences on an intense roller coaster of a plot. Nightcrawler is unforgettably haunting with a tremendously unique sense of storytelling. Highly recommended!